sailboat. : The High-End Tag: Favourite Luxury Make Up. I think this is actually called the Princess Tag, & I tried but I just can't call it that because I'm not princess-y in any way, so I've renamed it to the admittedly slightly-less-fun-sounding high-end tag. I've picked out my favourite 'luxury' products from each category and for the categories I don't have an answer for I'm going to skip or include a product I would really like to try, of which there are sure to be many! 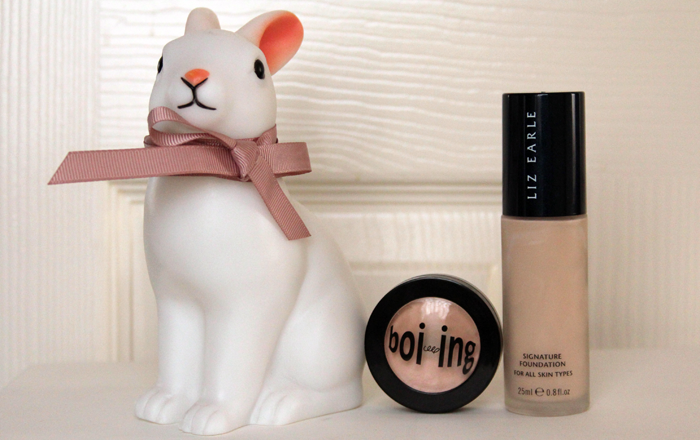 Benefit Boi-ing Concealer & Liz Earle Signature Foundation*. For foundation I was torn between the MAC Studio Sculpt and the Liz Earle Signature Foundation* and in the end, the Liz Earle won. I've really been enjoying this over the last month or so because I can apply a really small amount for a light coverage or I can build it up in the areas where I need a little more coverage. It gives a really natural skin-like finish, not too dewy or overly matte. It's a really nice all-round product. Concealer wise I had to mention Benefit Boi-ing because it's pretty much a little miracle in a pot. This is the concealer I go to when I have a particularly stubborn blemish or area of redness to cover, it's creamy, not cakey covers everything! I don't really have a favourite high-end powder, I usually just reach for my Maybelline Fit Me Powder*, which is super affordable or one of the Lily Lolo Mineral Foundations, which I don't really think count as high-end even though they're a little more expensive, because they last for ages so they work out really well on a cost-per-wear basis. I would really love to try one of the Hourglass Ambient Lighting Powders, but they're pretty expensive so I'm not sure I ever will! 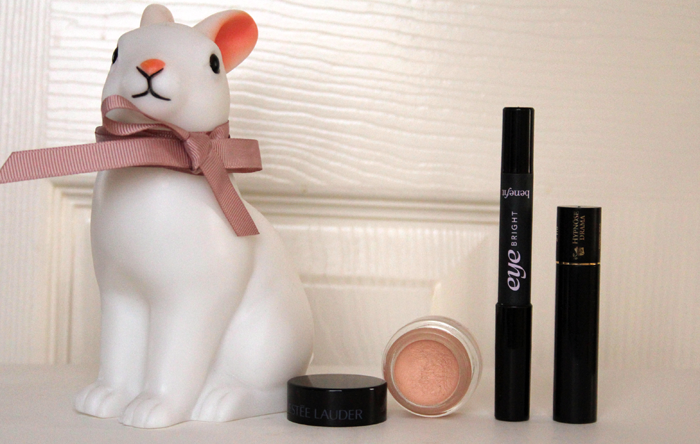 Estee Lauder Stay On Shadow Paint*, Benefit Eye Bright & Lancome Hypnose Drama mascara. It's no secret that I'm not a huge eyeshadow wearer but when I do I always use one of the Estee Lauder Pure Colour Stay On Shadow Paints*. These make really lovely bases and my favourite shade is Halo, which is a really neutral skin-tone that's perfect for everyday. They really do last as well, so they're named very appropriately! Not being a big eye make up wearer I also don't really have a favourite eyeliner, so I opted for the Benefit Eye Bright pencil for this because I really do love how much this opens up my eyes and makes me look a lot more awake on those horrid early mornings. I don't use this daily becuase it's quite often a step I simply forget, but I do notice a difference whenever I do use this. Not an essential product, but one that's nice to have I think. Mascara is something I always buy from the highstreet both because I think inexpensive mascaras are really good and I don't really want to spend too much on something I'll throw away after three or so months. That being said, I got a sample of the Lancome Hypnose Drama mascara in Boots I think and I have to say, it's really nice. It's super black and makes my usually pretty 'meh' lashes look pretty amazing. I don't think it's a million times better than Maybelline The Falsies though, so I wouldn't purchase it regularly, but as a treat I think it would be really lovely! Benefit Hoola bronzer, Dior Rosy Glow blush & Estee Lauder Pure Colour Illuminating Gelee*. For bronzer I have to pick my beloved Benefit Hoola. It took me a really long time to get around to trying this, but as soon as I did I never looked back. This is a really lovely colour for my fair skin because it's not super orange and it blends so easily. I've had this for absolutely ages now and it still looks like I've barely used any - I think this will last me a really long time, which is always good because these aren't cheap! Highlighter wise I couldn't not choose the Estee Lauder Pure Colour Illuminating Gelee in Heat Wave*, which was a limited edition release from this summer. I won't talk about it too much because I don't think it's available anymore, but it's a beautiful golden shimmer that although I don't use it everyday, I'm so happy to have this in my collection. My blush collection is pretty ridiculous but I knew exactly which one I would choose to include in this tag and it's the Dior Rosy Glow. This is without a doubt my most luxurious make up product, it was a birthday gift last year and I love it so much. Whenever a product comes with its own velvet pouch, you know it's pretty special! It gives the prettiest pink flush to my cheeks and always makes me feel that little bit nicer whenever I wear it. Worth every penny! 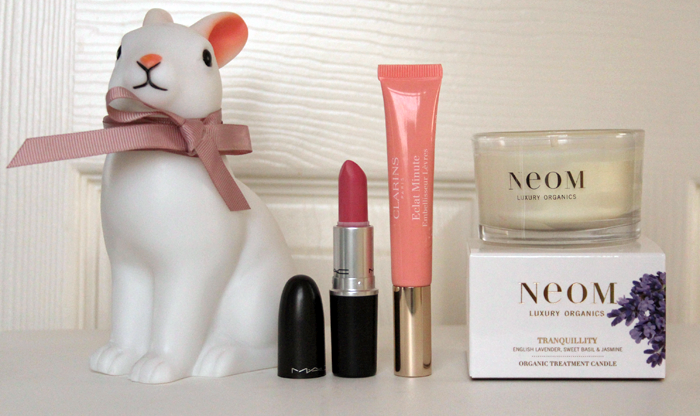 MAC Lovelorn lipstick, Clarins Instant Light Natural Lip Perfector & Neom Tranquility Candle*. Lip Liner, Lipstick & Lipgloss. I don't think I own a single lip liner and I must admit, I'm not sure that I ever will because they're just not that exciting to me and I don't really wear lipsticks that need one. Lipstick wise I've chosen MAC Lovelorn and although in general I don't think that MAC lipsticks are worth their price tag, I'll always make an exception for this colour because it's so lovely. It's the most perfect mid-toned pink for my skin tone and I really like the glossy lustre formula even though they're not the most long-lasting. The Clarins Instant Light Natural Lip Perfectors are easily my favourite glossy lip products, I've raved about them so many times and I still love them just as much as I did when I first tried them. They're super smooth, comfortable to wear and they really do make my lips look perfected and hydrated. Lovely! Brows, Misc (candle, bubble bath, tool etc) & Nail Polish. I don't like my brows to look really polished, I think when they're filled in and groomed to within an inch of their life it just makes my face look weird! So I tend to just let them do their own thing and I'm okay with that - sorry to all brow lovers! I also don't have a favourite nail polish, I haven't managed to kick my horrid nail-biting habit for long enough to build up a collection of polishes I really love. I'm working on it though! I do definitely have a favourite candle though and it's the NEOM Tranquility Treatment Candle*. There's no denying NEOM candles are incredibly pricey, but they really are work every penny and they make the most beautiful gifts. I'll be picking up a few of these as Christmas gifts this year because I've managed to get a few of my nearest & dearest hooked on them! I love that Lancome mascara! I didn't think I'd ever find one as good but I'm now surprisingly in love with Revlon's new Lash Potion - I think it's my new fave. Definitely going to add BOI-ING to my Xmas list! Great picks ! I love them all ! I totally agree with you on the mascara front: i think the high street has plenty of excellent offerings, and i also have to agree with you that the Lancome Hyptnose is truly amazing! I use it too! Oh and if you're ever looking to try something new, the YSL Volume Effet Faux Cils is also out of this world. Great post! 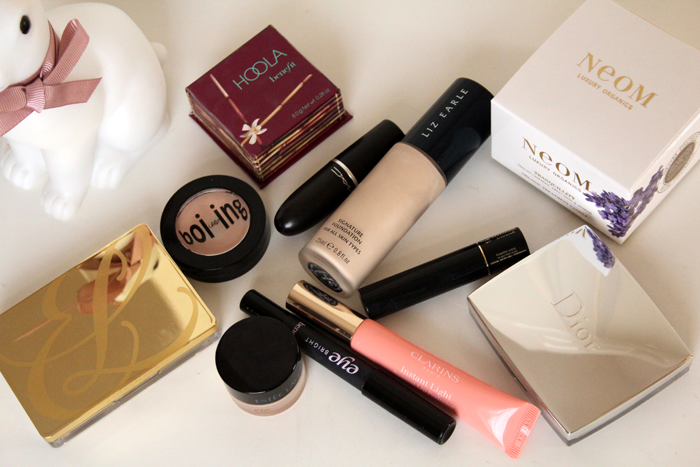 Hoola is my favourite bronzer without a doubt :) That Dior blush looks so pretty! Great tag, I really enjoyed reading it, love the dior blush the most. I have a dior lipstick and everytime I put it on it feels really special!! I have tried MAC studio sculpt and honestly wasn't wowed, I always find their foundations seem to sit very strangely on my skin. I also am very pale and they always seem on the yellow side! all these products look so amazing! I am definitely in love with Boi-ing and that Mac lipstick! Ooh so many pretties, Estee Lauder makeup just always looks so damn gorgeous eh! I've never seen this tag before but it looks like so much fun to do! Really enjoyed your answers and particularly the gorgeous photos. I wish Liz Earle were available in Australia - both skin care and cosmetics! I wonder how you got your Hoola to look so nice - mine has basically sealed except for a small circle in the centre, and everywhere around that one patch is really dry and a little bit dirty-looking. It always happens to my powders for some bizarre reason. I've been getting into candles lately so the Neom one sounds right up my alley (though not so much the price tag...lol). You picked some lovely products & many that I love too! The Mac Lipstick is a pretty colour. I need to write that down & swatch it next time Im in the Mac store. I always get so overwhelmed by the choice when I go in & forget what I am actually looking for. I think my heart skipped a bet when I saw that Dior Blush. It is beautiful! I love saying Neom. It reminds me of something I can't quite place. Neom. I'm curious about the Benefit Boi-ing. Would it do well for stubborn dark circles? I really like its cute packaging. The Dior Rosy Glow blush suits you so well. You always look radiant and awake so understanding how you achieve that is great! Thank you so much for this post and sharing everything! All the photos are beautifully taken too! 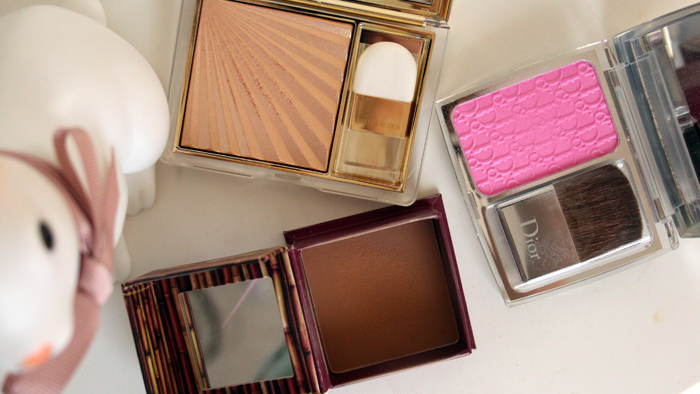 That dior blush is heavenly!